For a wow-inducing impact on the show floor, turn to an eye-catching, captivating off-the-shelf 20ft x 20ft Island Exhibit. Island exhibits feature commanding structures to broadcast branding across the show floor, plentiful floor space to welcome visitors in to learn more, and provide space for messaging, products, conference areas and more. 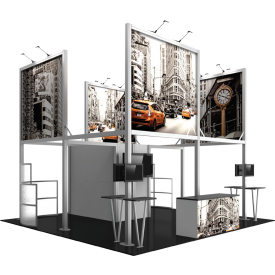 Choose from the soaring fabrics of Formulate® Fabric Island Exhibits, the modular Hybrid Pro™ island exhibits and the no-tools-required Orbital Express™ Truss island exhibits to find the best match for your exhibiting needs. Formulate® Fusion fabric island exhibits provide an unparalleled dynamic that elevate and accentuate a message and brand, but also maximizes the return on trade show investment. Formulate Fusion 20ft x 20ft exhibit kits are a fusion of tubular forms, fabric and function, combining organic and architectural shapes with state-of-the-art zipper pillowcase dye-sublimated fabric graphics to create unique, dynamic and functional island spaces. 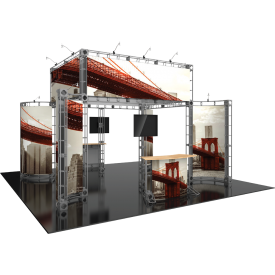 Hybrid Pro™ Modular 20ft x 20ft island exhibits are contemporary and bold modular displays that broadcast branding over the show floor. Exhibits feature towers, laminated panels and semi-private meeting areas and more to create a commanding presence. Accents such as monitor mounts, literature racks, display lighting and more add function and style to the exhibits. Optional counters add reception areas, secure storage and space to display product. Orbital Express™ Truss 20ft x 20ft island exhibits are off-the-shelf exhibit kits that provide a custom look and feel. Kits feature a fixed number of parts and connectors, and easily assemble with no tools necessary. The eye-catching designs, towering graphic panels and counters draw visitors in to your space. 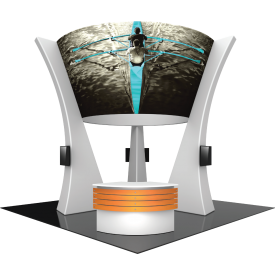 Numerous exhibit designs and options are available, and 20ft x 20ft island kits transition into new configurations or smaller displays for added versatility.